Aleksander Nikolaevich Cherednichenko was born on February 26, 1958, in Lozova, Kharkiv region. He finished Kharkiv State Art School in 1977 and graduated from Kharkiv of Arts and Industry (now it is Kharkiv State Academy of Design and Arts) in 1982. He participates in international, foreign, republican and regional exhibitions. In 1992 he became a member of National Artists’ Union of Ukraine. 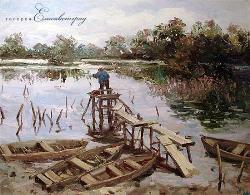 In 2004 he was given a rank of Honored Artist of Ukraine. His works are stored in the Directorate of exhibitions of the Ministry of the Culture of Ukraine, in Sumy Region Art Museum, Chuguev Art Gallery, in the Museums of Regional Studies of Shostkin, Konotop, Romensk (Sumy region) and Lozova (Kharkiv region), in the Museum of Russian Art (Kyiv), in the Cheboksar State Art Museum (Chuvashiya, Russia), in the Fund of Cultural Heritage (St. Petersburg, Russia), in the State P. Tichina Memmorial Flat (Kyiv) and in private collections of Ukraine, Australia and countries of Europe, Asia and America.